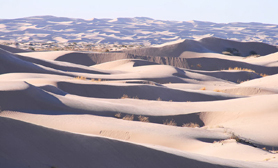 In the extreme eastern part of the state the Chihuahuan Desert dominates due to low rainfall and extremely high temperatures; some areas of the eastern part of the state are so dry no vegetation is found like the Sand Dunes of Samalayuca. 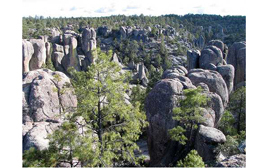 There are two distinctive climate zones found in the eastern part of the state: Hot Desert and Cool Desert which are differentiated by average annual temperature due to differences in elevation. There is a transition zone in the middle of the state between the two extremely different climates from the east and west; this zone is the Steppe characterized by a compromise between juxtaposed climate zones. 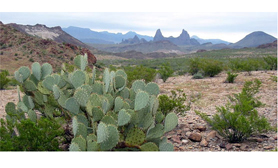 Oddly, the Chihuahuan Desert varies slightly from cool in higher terrain to hot in low elevations. Subtropical Highland most common at elevations above 7,200 ft (2,200 m) above sea level; this climate zone has warm summers reaching a maximum temperature of 82°F and summer lows of 50°F. Heavy rainstorms are observed from July to September. Winters are cold reaching a maximum low of -4°F and a maximum high of 17°F. During the winter months many snowstorms are observed with typically 1 meter (3 ft) of snow per season.